Most corrupt countries have a large proportion of youth in the population. A big number of anti-corruption efforts are already operating in those states and there are surely more to come, but in most cases, youth seem to be left out of the fighting rings. The members of Global Youth Anti-Corruption Network and young people participating in the 14th International Anti-Corruption Conference could not just sit and wait to be older to join the ranks. They say, or even SHOUT, that they must be heard. That they have the right to participate. That they might get better, fresher ideas than the older generations. Over the four days of the Conference, more and more youths are asking and demanding for their rights to the (mostly) older panelists. But it�s not enough, they�ve prepared their version of Bangkok Declaration. �We call for greater commitment from the international community towards involving young people at all levels in the fight against corruption,� the Declaration stated. The commitment they�re asking are: committing funding to global youth activities; providing support to youth leadership and empowerment processes; and creating spaces and opportunities for youth to affirm themselves as key partners in the global fight against corruption. 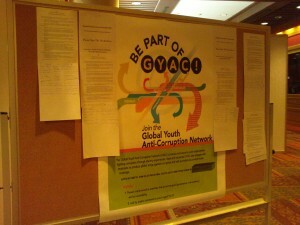 They�re inviting the youth and those who support the involvement of youth to sign the board nearby the Plenary Hall. NOW. PS. Chair of Transparency International Huguette Labelle expressed her support on the cause. �Youth participation is essential in anticorruption, because first of all youth have the energy, they live in the communities, they also are able to think new in terms of what to do to prevent it and to deal with, and to find it when it happens,� she said. Labelle believed the world need to involve youth as full participants in the fight against corruption in a much bigger way than we have until now. �We have some chapters which involve youth in a very big way, but we need to make it more across the board,� she said. PS2. The panelists in the closing plenary are also expressing their support now. Let�s hope and make sure it won�t end as lip service. PS3. You can read the full Bangkok Declaration of Young people here: http://voices-against-corruption.ning.com/profiles/blogs/bangkok-youth-declaration. Three PS-es are enough, right? Pssssttt this post is also here and there.